Below is an article that was published in March 1985. While not a complete history of the boat, it does offer insight into the early years. Laser International now has a year under its belt in the manufacturing and marketing of the Laser 28, and this news­letter is an update for existing owners and for the nearly 5,000 people who have so far expressed an interest in the boat. The development of a new product, and in this case a totally new concept in a racing-cruising sailboat, is never without its problems, and the Laser 28 has followed the normal pattern. As most people have shown interest in both the manufacturing and marketing of the boat and the development of the Class, we will treat all of these items separately. Manufacturing started in March of 1984 and, despite my best will and intentions, we were unable to achieve the production levels we had hoped for and only demon­strator boats were built for our represen­tatives during the summer. The first customer boats were delivered at the time of the Annapolis Boat Show in October 1984 and since then our output has steadily increased to the point where, at the time of writing, the factory is producing in excess of three boats per week. That level will increase to four by the end of March, and if our level of quality can be maintained, we will be at one a day by early summer. No changes have been made to the basic layout, rig, or structure of the boat, but those of you who saw the original prototype in Annapolis in 1983 would find the quality of the interior significantly improved in the small detailing. All of the first boats were produced using the hand-laid method for the decks which were then subsequently finished by hand. The level of this finishing has constantly been improved to the point where, at most boat shows, visitors to the boat have to be told that the deck is not produced in the closed-mold. Perhaps because of the importance given to the closed-mold in the original literature, a mystique appears to have built up around the process, which is really without foundation. The raison d’être for the closed-mold has always been a reduction in the cost of manufacturing the boat as no liner or interior finishing is needed. There are no performance advantages of one over the other. The weight differences are within the normal tolerances of the hand-laid process and no one who has a hand-laid deck will be at any advantage or disadvantage on the race course. We have shipped three boats so far with closed-mold decks and are slowly chan­ging over the line as all the small tech­nical bugs that relate solely to the quality of the finish are ironed out. Sometime in 1985 we will be fully converted. Prior to starting on the Laser 28 project, Laser International made the basic decision not to market the boat through its existing network of some 300 dealers. The reason for this was because very few had experience in the big-boat field and the Company decided it did not wish to build boats at a rate that would be required to supply that network if the boat proved to be successful. Instead, we opted to market the boat directly to the consumer and to use “Representatives” in fairly large areas who were extremely enthusiastic about the product and who would demonstrate and promote the boat by virtue of having one themselves. In return for their support they would receive a small commission on all boats sold in their territory. These territories are much larger than would normally be covered by a “dealer” but, the Rep’s main responsibility is not to stock and sell boats but to create visibility for the boat and to organize and create Class activity. As this activity expands throughout the area, the Reps continue to receive their commission and hence to stay interested in the development of the Class. This concept is working extremely well and, of paramount interest to the consumer, results in a considerably lower purchase price for the boat as there is no built-in dealer margin. The following map (not included) shows the location of the boats that will be sailing by May 1st and the numbers in the circles correspond with the list of representatives that follow the map. These Reps all own boats that are available to be seen or sailed and, in addition, have a supply of VHS or Beta video tapes of the Laser 28 being sailed and manufactured that they will be delighted to mail, on loan, to anyone inerested enough to contact them. Approximately 140 boats will be sailing by August 3 1st, 1985 and we will decide at that point whether or not to increase production beyond the one-a-day level. Although it is still too early to confirm anything, the wheels are now in motion to introduce the production of the Laser 28 in Europe at approximately that same time and a demonstrator boat is now actually sailing in England. There are no plans whatsoever to develop a “line” of boats of incremental lengths on either side of the Laser 28 as most sailboat manufacturers have done. The Laser 28 is our “big Laser” and our only big boat. It represents a multi-million dollar investment and one to which we are giving all our attention; the same level of attention that the original Laser received. Believe it or not, that little boat will be 15 years old in October, yet still represents the finest investment in dollars per sailing hour available on the market today. This is because the boat has never been modified or produced in an “improved model”, continues to have its activities as a Class fully supported by the Company, (it is the strongest Class in the world) and enjoys an unsurpassed resale value. The plans for the Laser 28 are no different and we will not dilute our efforts across a line of boats. On this same subject, however, many people who knew the boat have asked what plans we have for the very fast, cruising, Farr 38, a prototype of which we built and exhibited at Annapolis in1981, called Early Byrd. There are over 100 of these Farr designed 38’s sailing world­wide and the boat is truly a “big brother” of the 28; a very fast (PH RE 81), com­fortable, good looking, easily handled fractional rig which is not designed to any rule. All the production tooling and moulds were finished prior to the Laser 28 project and are now sitting in storage, but we do not have the human resources at this time to mount its production even though it obviously would not require the same time and effort to develop the Class profile that the Laser 28 needs. In a few years, however, when the 28 is firmly established, we will undoubtedly approach Bruce Earr for a license to produce the boat as the final link in a chain of boats spanning the full spectrum of sailing from age 1610 60! Meanwhile, Early Byrd is in Annapolis and is now for sale. On a final marketing note, we are extremely pleased that Steve Colgate’s Offshore Sailing School at Captiva on the west coast of Florida, off Ft. Myers, is now running its Advanced Race Program in 4 Laser 28’s. These are one-week programs with intensive on-the-water instruction yet carefully scheduled to provide ample free time during the day so that the week can also be a marvelous holiday. Each week Steve brings down a Guest Expert who is well known in the yachting world and it is a fantastic opportunity to sit and listen for a week to the likes of a Bill Shore or an Ed Baird tell you how it’s done. I’ve been lucky enough to be chosen by Steve on several occasions as the Guest Expert and can say, unequivocally, that it is an outstanding value. The Laser 28 Class Association has been formed with a provisional Governing Council to run its affairs until the first general class meeting at the North American Championship in Kingston, Ontario in August (see Regatta Schedule). The Council is made up of our U.S. Rep. Lucy Minihan, from Sodus, New York on Southern Lake Ontario, our Canadian Rep., Don Morgan from London, Ontario and Paul Lestock, who represents the manufacturer. Tim Coventry, of the U.K., who was a President of the worldwide International Laser Class for 10 years and who with Bruce Farr and with myself instigated the Laser 28 project, is also an ex-officio member of the Council. The Class will have a provisional Constitution and Class Rules which will be mailed to members in the First Class Newsletter in early April. Owners will automatically receive this information, but should anyone else be interested, they should drop us a line and we will be glad to forward it. East Coast Championships Estimated attendance 10-15 boats. A permanent trophy has been presented by Michelob and it is envisaged that this regatta will change venue up and down the coast each year. May25: A series of very short races run back to back with a break for lunch. The idea here is to keep the Fleet very close together and provide a learning experience for new crews. The goal is 6 races, 3 to 4 miles in length. May26: Long Distance Race. Approximate distance 20 miles. May 27:Two Olympic courses, approximately 8 miles each. Quebec Open Championship Estimated attendance 10-12 boats. Host: Royal St. Lawrence Yacht Club, Championship is run as part of their June regatta. June 7: Launching and, at 2:00 pm, an on-the-water clinic with Ian Bruce. US Nationals Estimated attendance 15-20 boats. Hosts: Edgewater Yacht Club, Cleveland. Regatta run in conjunction with Cleveland Race Week, July 12-21. 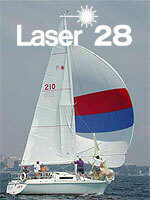 July 12: Laser 28 Class runs three moderate length triangular courses of its own. July 13: Cleveland Race Week starts. Laser 28’s start in PHRF Fleet. Approximately 17 mile race. July 14: Laser 28’s start in PH RE. Approximately 17 mile race. This is end of US Nationals, but Cleveland Race Week continues through the 21st for those Laser 28 sailors who wish to compete in the week. North American Championships Estimated attendance 30 boats. August 16: Launching and Registration. August 17: Laser 28 Class runs three short triangular races of about 8 miles on inside course. August 18 and 19: 28’s start with CORK Offshore PHRF Fleet. 15-30 mile races each day. August 20: Start 1 70 mile Long Distance Race. This is not counted as part of Laser 28 North American Championships, although many will take part who are competing for the CORK trophies. The Class Association is organizing a cruise to the 1000 Islands on the 20th and 2lstforthe remainder of the fleet. August 22: Final CORK PHRF race. 15-30 mile course race. Robert Dunkley of Nassau, Bahamas, took delivery of his boat on Saturday morning in Ft. Lauderdale, put the sail up and sailed straight to Nassau with two friends. (That’s putting a lot of pressure on your builder, Robert!) 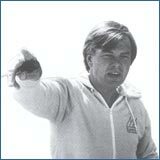 They sailed through 30 knot north winds in the Gulf Stream with 10-15 foot waves. When asked if there were any problems, two surfaced: the Compass gimbal had been broken in transit from Montreal and when they arrived in Nassau “the rigging was slack”! (This would be normal after the first few times of even normal sailing as all toggles, shroud attachment recess, etc., bed in.) Please, don’t anyone else do that! Judy and Frank Button from Vancouver sailed their Laser 28 to a fourth straight win in the IYC winter series. Judy, the skipper, has only been racing two years having raced their Tanzer 7.5 for the first two years. Boats in the fleet include: Dash 34, C & C 33, C & C 34, Mirage 33, Reliant 37. Frank and Judy are moving back east to Grimsby, Ontario and plan on attending the Quebec Open in June. Paul Kaplan, well known sailor on San Francisco Bay and our Rep for that area, singlehanding his Laser 28 on only its fourth outing sailed to a first in class and first overall in a 38 boat fleet in San Francisco’s Singlehanded Sailing Society’s “Three Bridge Fiasco Race”. Paul’s only comment "The boat is outstanding!" His wife, Chris, meanwhile, sailed the Laser 28 with an all girl crew to third overall in their Women’s Racing Association winter series. Nearly 50 percent of the boats sold so far have been sold with trailers. At $2,450 US or $3,000 Can. the trailer pays for itself quickly, especially if the owner picks up his own boat. Add to this the saving of a yard cradle and the ability to store the boat on one’s own property or in some other non-revenue location and it pays for itself in a couple of years.